In 1997, the year that Neil Gaiman’s first novel Neverwhere was first published, I gave birth to twins plus I already had a 20-month-old so I wasn’t doing a lot of reading. A few years later, we moved them all to the Sahara desert, which was also bad for my reading (at least in English). So that’s my excuse for never having read this book before now. As the author explains in the prologue, the novel was originally a screenplay for a television series, and while they were filming, he kept thinking of new scenes that he wanted to add. When he was refused, he began to say, “I’ll just put them in the novel,” and it grew from there. However, through the years as Gaiman gained recognition and fame, various versions were published–with different introductions, the original in the UK and then the US version because publishers think Americans can’t figure out a few British expressions, etc. Now, going on 20 years after the original, Gaiman has put together his favorite of all the versions and published them as an author’s preferred text. And in case you’re wondering, the introduction is the one where Richard is being sent off by his mates in Scotland to start his new job in London, and meets a mysterious woman to whom he gives his umbrella with the Map of the Underground on it. It was great fun to find a new adult fairy tale (I’m using the term adult to mean a book written to adults. You could probably let your grandma read this book, depending on how hip she is). Richard Mayhew is your average bloke, pushed round a bit by his girlfriend, a quiet businessman, going to the pub in the evening. On a night that has been more than normally disorganized (best line ever: “That was tonight? Richard paused for a moment. If ever, he decided, they made disorganization an Olympic sport, he could be disorganized for Britain.”), Richard spies a young woman lying bleeding on the sidewalk. He rescues her and takes her to his apartment to keep her safe, in spite of his fiancée yelling at him that they’re going to be late. The next morning, all traces of the girl are gone, and Richard seems to be invisible. His apartment is being shown to new renters while he is actually standing there; his desk is being taken over at work. He can’t catch a taxi. He wanders down into the Underground and finds himself transported to Neverwhere, London Below, a mystical vaguely medieval place of all times superimposed on the other, with shepherds still at Shepherds Bush (those who go there never come back), and bishops still at Bishopsgate (where you have to get through Ordeals to survive), and there is an elephant at Elephant & Castle, and an Earl holding a court at Earlscourt. Survival is by no means easy. Richard manages to reconnect with the girl, Door, who turns out to be a young noblewoman looking to avenge the deaths of her family. The Marquis de Carabas, self-proclaimed, elegant and mocking, with a long fitted coat the color of a wet street, serves as Door’s confidante and protector. Their bodyguard is the legendary Hunter, an elegant woman with tall boots. There are lots of colorful characters peopling this shadowy realm, including an angel (at Islington, of course), and the rat-speakers, and rats themselves are personages of some importance as one would expect in an Underworld. And when the disembodied voice pleads with you to “Mind the gap,” you’d better listen. The Gap is a creature of smoke and fire who pulls you under the train and traps you there. Just as time is compressed and pleated, so is space. It’s hard to work out in one’s mind just where Richard is as he travels with his friends, facing the Great Beast of London, an Ordeal which thousands before him have failed, and other quest-like items. Gaiman’s trademark sense of humor is in evidence throughout, and Richard is a delightful sort of anti-hero, unbelieving, complaining, and all. 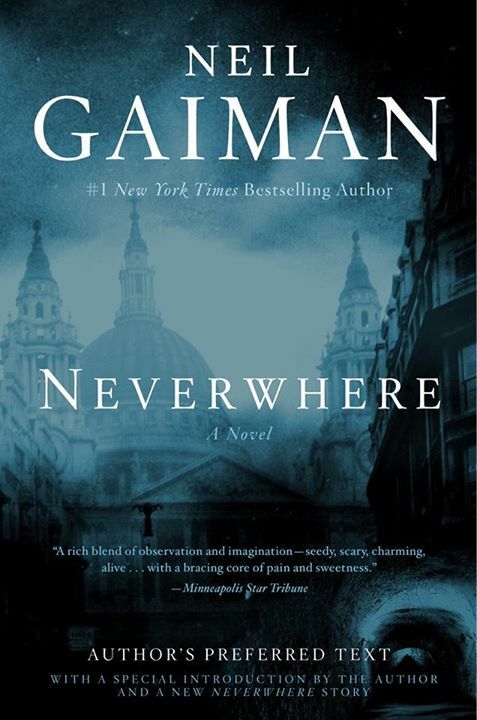 Neverwhere is a great story, a fun place to visit, and a good antidote to a grey, dull life. This new version includes the short story How the Marquis Got His Coat Back, and the promise of a sequel as yet to be written. If you like fantasy and haven’t been living in a box, chances are you’re already familiar with this tale. If you aren’t, you’re in for a treat. If you’ve read other versions, I’m sure you’ll leap at the chance to read the version that Gaiman himself thinks is best. And here’s hoping for a sequel. The way that this book grew over time intrigues me. I’m glad to know that the author FINALLY got to put everything he wanted into this story.